Editor's Note: This interview originally appeared on the Column Five blog. How do you market to marketers, maintain fresh creative, and keep your team inspired and connected across continents? Megan Golden, Group Manager of Global Content Marketing for LinkedIn, has a handle on it. In this interview, she chats with Column Five Cofounder Josh Ritchie about how LinkedIn connects with its members through emotional content, why you don’t need a million-dollar budget, how to turn your team’s passions into unique content, and more. JR: How does LinkedIn differentiate the brand through the use of visual content? MG: At the corporate level, we have a brand that’s very emotional. Over the past decade, an abundance of psychology research has shown that experiences bring people more happiness than new possessions. So we strive for our audience (500+ million members) to feel something. Everything we do and say and produce always comes from that core question: Is this good for the member? How does it benefit the member? We lead with emotion by being very member-first from the very core of LinkedIn, our vision and values, down to the visual creative. We focus on making the members the heroes, showcasing aspirations and journeys through photography and film. For example, there’s a video our corporate marketing produced called Closer Than You Think, which ran during the Oscars two years ago. I think it’s really powerful and shows that sort of emotive style of visual content that we’re really good at. Beyond the corporate level, because LinkedIn has several business lines and several marketing teams, what’s unique about what we do for LinkedIn Marketing Solutions (and how that impacts our visual content) is that we market to marketers. Marketers are the worst skeptics toward other marketing. We can see through all of the marketing BS. So our audience really holds our team to a higher standard as content creators. We’re constantly trying to push the boundaries of our own work while also highlighting other brands that marketers should admire. It’s really about our audience sort of forcing us to become better, more inspiring, and marvel marketers in our visual content. Our Community team, which works closely with some of our most inspiring customers, recently produced a story that is a remarkable example of how we bring emotion to our content and provoke our members to see the humans that make up the largest network of professionals. JR: What are your most successful pieces of content, and why do you think they’re so successful? 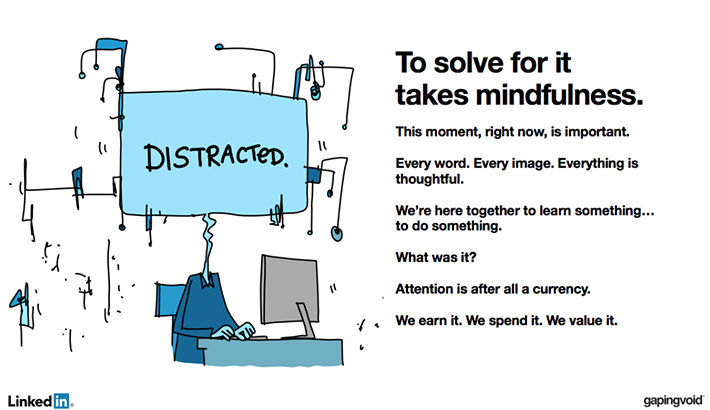 MG: We did an e-book, Attention is a Currency, which was a partnership with the artist Hugh Macleod and Brian Solis of the Gapingvoid that has received several awards. It stands out more than any other piece of our content because it is an extremely fun and unique approach to storytelling. The whole concept is that we tend to assume that because consumers are consumers, they’ll naturally consume everything we produce. It becomes easy to think of our work as just content and to say that marketing just does the publishing and promotion of that content. But in an era when the flow of content is accelerating while the adult attention span is declining, this e-book really pushes the point that we need to move beyond this assumption. We need to focus on the human aspects of engagement. This was a really great piece that was successful because I think it really stood out from the noise. It was a very provocative topic that was distilled in a way that was very digestible. There was also a sort of intrigue about something coming from LinkedIn that had that Hugh MacLeod illustration feel to it, which I think raised some eyebrows. We also did this profile on the marketers behind Holiday Inn Express, sort of a new take on a case study, which featured beautiful and unique photography that really tells that hero story. As content marketers at LinkedIn, I think we truly believe that gone are the days of that one-sheet of challenges, benefits, solutions, etc. Instead, it’s really all about the story and the journey. These visuals really bring out the characters behind the Holiday Inn story and are very real in a genuine and delightful way. JR: What’s your team’s approach to constantly upping the ante? Do you have a motto or a shared vision for what it means to continually do better and better work? MG: We have a very critical audience, so we have to constantly ask ourselves, “Would we as marketers admire this work?” For example, take stock photography. Even though LinkedIn Marketing Solutions is the fastest-growing business line at LinkedIn, we still operate on a fairly conservative budget. But we try to avoid stock photography at all costs. At the scale that we’re producing content it’s impossible to have custom photography for every little thing, but I would say 9 times out of 10 we leverage custom photography. We’re not hiring these massive agencies for photo shoots either, so we decided to go scrappy and do our own photo shoots. We set up very simple shoots with our own employees, who are real marketers, and created a new library we could use for months to come. Every marketer or marketing team should have someone who can do this. The investment is so small, you know, under $2,000. You can get a good setup that will pay off inevitably. It’s just one way that you can kind of go scrappy on the back end and no one will really notice on the front end. We also don’t really take ourselves too seriously. We have this sort of rally cry at LinkedIn called “taking intelligent risks.” It’s an incredible piece of the fabric of our career development at LinkedIn. The idea is that those who coach their people to take intelligent risks will attract and inspire the most innovative employees, and then those employees will take the company to great heights. So as part of our team, I like to encourage at least two intelligent risks a year. The most recent one was really interesting. 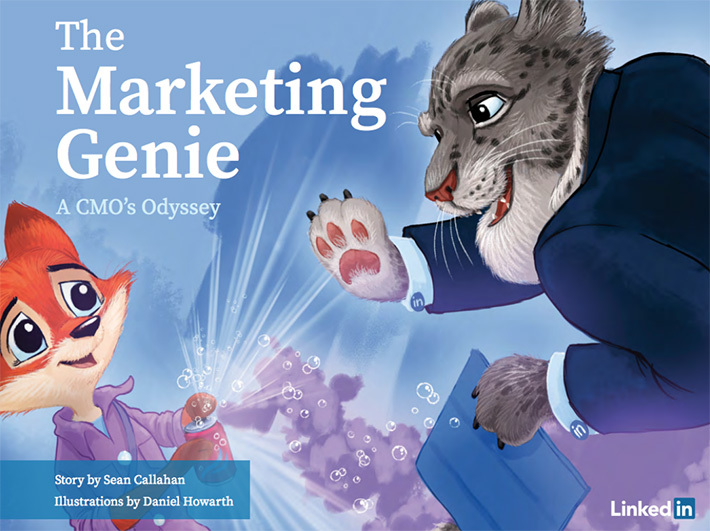 Sean Callahan is editor-in-chief of the LinkedIn Marketing Solutions blog, but he also has a side project writing children’s books. He wanted to somehow marry the two, so we talked and thought, “What if we put our marketing story through the lens of a children’s book?” It wasn’t necessarily about how to make marketing at LinkedIn sound rudimentary or elementary; it was about how to be more playful and, again, rise above the noise. So Sean wrote this book called The Marketing Genie, and we hired illustrator Daniel Howarth. It tells the tale of an intrepid marketer, a little fox named Liz Cleese, who journeys to the ends of the earth (or at least to Las Vegas) to get the answers to three questions that are keeping her up at night. It’s basically a meta-narrative about how marketing on LinkedIn is like a genie—the only place to really solve all of your B2B marketing problems. It’s a really sweet story. It’s a fun thing to give Sean this opportunity to integrate his personal passion with his professional passion—and a lovely way to keep our team and our audience on their toes in terms of the types of content we create and share with them. JR: When it comes to your own content marketing, what are you most excited about? MG: First, I love that we get to market to marketers. We are talking to people who are doing the same thing that we are. We’re having the same problems, and it’s really our job to help them solve those problems. Before LinkedIn, I was marketing to CFOs and CTOs. That took a lot of my brainpower to identify with, but now it’s so much more natural for me to identify with my audience. I can use that extra brain power to find creative ways to engage with them. Second, my team. We create such a copious volume of really quality content, and I think that’s nothing short of awesome. When I first came to LinkedIn two years ago, I came here to work for Jason Miller. I’ve been idolizing his marketing craft from afar for a really long time, and I basically turned into my second grade self at a New Kids on the Block concert when I went to work for him. I was so full of excitement to work and learn from him, to be inspired by his outrageous content ways. When he moved to London in the Summer of 2016, I inherited his team—one of the most intelligent and creative teams that I’ve ever worked with. Sean is one of the most talented writers and has no clue how funny he is. Alex Rynne, who executes a majority of our content strategy, is so good at seeing the big picture: what we’re saying, how we’re saying it, and when. 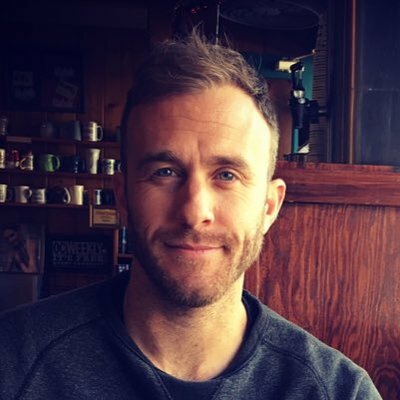 Then we have Steve Kearns, our social guru, who is owning social strategy for two business lines and cracking us up with his anecdotes of adjusting to SF, having grown up in LA. And last but certainly not least, Alex Hisaka is a woman who really knows how to scale content hyper effectively by being extremely data driven, something that the team really depends on. It’s really about the team. I think it’s sort of the perfect puzzle of team synergy that is able to execute on a content strategy that is equal parts effective and inspiring. JR: What are some of the more common content mistakes that you see other marketers making? MG: I think that there’s a sort of shiny object dilemma, where marketers are excited about and experimenting with new formats but not really defining the goals and objectives first. So they put all these resources and investment into something new and sparkly, but once it’s out there, they don’t really know how to evaluate its effectiveness. JR: What are some easy ways that marketers can get started with either using visual content or upping their visual content game? MG: Social is really the easiest way to experiment with visual content if you’re looking to up the ante. The investment is low. You can experiment and test really easily. Once you’ve tested enough, you can really expand confidently, whether in long-form content or a campaign or even a new brand identity. JR: What is the biggest value visual content delivers? JR: How do you see visual content evolving in the near future? I noticed you recently made the move to support video on LinkedIn. MG: Yeah, it’s related. I definitely feel like video is, or is going to be, evolving the most. I feel like if we take it up one level, a marketer thinks, “Oh my God. This is really expensive. It’s going to take six months to produce. What’s our ROI in this?” But I think that we should flip the coin on how we perceive video, or at least the end result, and focus on how perfection isn’t everything. You have to be hyper-relevant; you have to be timely. You don’t have the time to invest in these high-production, long-production cycles of creating content. We need to get comfortable with things that are low production, unfiltered, even live. Everybody wants in on the content game. Everybody’s trying to figure it out, but compelling content shouldn’t be restricted to these mega brands with these billion-dollar budgets. I believe that we’re going to have to get comfortable creating imperfect content in order to reach our audience in compelling ways, on matters that mean the most, in the most timely manner. JR: Who’s doing some work that really inspires you and your team? MG: Hands-down, I think the best content I’ve seen this year is MailChimp’s “Did You Mean MailChimp?” campaign. And it’s two-fold, right? One, the strategy behind it was so genius. To solve this perception of nobody understanding their name or what they do, they did this really provocative creative, and I think it’s so rare that companies get both of those right at the same time. Usually the strategy is totally on point, but the visual creative is vanilla. Or it’s too visually creative that it totally misses the strategic point. JR: What keeps you and your team motivated and excited about content? MG: I haven’t really asked them this question flat out, but I have some assumptions. One is that we create an immense amount of respect and trust within the organization that allows us to experiment often with new ideas, new concepts, new formats, etc. I think the notion of having a wacky idea, testing it, and then running with it is a really empowering feeling for the team. Second is we have created a really solid, global collaboration framework. We have strong global alliances within LinkedIn, so we’re constantly getting these fresh, international perspectives from all these other regions. This really allows our content ideas to take off globally and grow at this immense scale. JR: What inspires you as a marketer? MG: There’s sort of this journey that I think an individual contributor goes on and transitions away from when they become a manager. When you’re an individual contributor, you’re creating these concepts, working with the agencies, writing, choosing the creative concepts, planning out the details, and putting something together. You get so excited when everything comes together for a launch, but then you move on to the next stage in your career. I have definitely struggled with finding the balance of the doingversus the communicating and the aligning of a strategy. For me, it’s really important that I get inspired when I can help my team understand how they, as individual contributors, relate to the bigger picture. A lot of times content marketers can just feel like they’re a cog in the machine, and if they ever stop, the whole program is going to stop. To alleviate that negative feeling of just being a piece of a machine, we focus on really understanding how what they’re doing affects our bigger business objectives. We’ve become really keen on creating much broader content roadmaps and strategies that align to what’s important for our line of business and what’s really going to move the needle. Connecting the dots for that really inspires me because I can see that they are getting the big picture and understand how what they’re doing is really making an impact. JR: What are some of the challenges content marketers face as it relates to scaling? MG: When Jason moved to London and I was going to be running North America, we both wanted to really commit to solving the global collaboration issue. At the time, each region was completely siloed and there were massive amounts of missed opportunities where we could leverage each other’s content, or we were creating duplicate content and wasting resources. But solving these issues wasn’t easy. It takes consistent touch points, transparency, and a few joint global launches to understand all of the roadblocks you’re going to have before you can actually have a successful global launch. It’s also critically important to have an effective alignment conversation with your leaders and cross functional partners. Otherwise, the lack of getting internal buy-in from your internal stakeholders can have downstream effects, derailing your content roadmap and exposing your team to pure chaos. Suddenly you find yourself missing goals because you’ve been asked to chase the shiny object. But I think that this can be solved. It starts with building a solid rapport with your executives, getting them to commit to your plans quarterly or annually or whatever your cadence is, and making sure they understand how these plans back into or support the broader business objectives. JR: Are there any interesting lessons you’ve learned about what works really well on the LinkedIn platform, when compared to other social media platforms? MG: It’s pretty simple. Our differentiation is that it’s really about our targeting capabilities. It’s the largest professional network. It’s a very high-quality audience, a member base that self-updates their own data. It’s executives and decision-makers and influencers all coming to LinkedIn to do business better, so it’s really that professional context that sets us apart. JR: What’s one last piece of advice you’d like to give our readers? MG: Don’t be a lazy marketer. Don’t find yourself phoning it in, being vanilla, asserting a blanket narrative instead of leveraging effective targeting and relevant content. And make sure that you keep your finger on the pulse of marketing trends, so you don’t just default to the ways that you are stuck in. Constantly seek new knowledge around innovative marketing, too. Make sure that you hold yourself and everybody around you to a super high standard. Don’t be afraid to be harrowing to each other in terms of raising the bar or calling each other out in a constructive way when something isn’t to the caliber that your team committed to. Lastly, be deliberate. That sounds very vague, but I was very inspired by this documentary called Minimalism: A Documentary About The Important Things. And it’s not minimalism in the sense that it’s a lack of things but the message of the documentary is really about being deliberate in every facet of your life and only maintaining the things that provide value and avoiding the fluff. It’s something our team reminds each other of often, doing less better. Keep pace with the latest in digital marketing by subscribing today to the LinkedIn Marketing Solutions Blog.